Three games into his return from a knee injury, it’s safe to say that Zion Williamson is back and possibly, somehow, better than ever. The Duke phenom steamrolled his way through the ACC tournament, posting 27 points and 10 rebounds in three games while shooting 76.7 percent from the field and throwing down the same kind of dunks that have turned him into the biggest story in college basketball. That production has put Williamson in some, shall we say, exclusive company. Duke now has a chance to receive the No. 1 overall seed in the NCAA tournament, and there is little chance it would have been able to do so without Williamson. It has undoubtedly been a cathartic week for Williamson. However, it was an open conversation whether or not it ever should have happened. 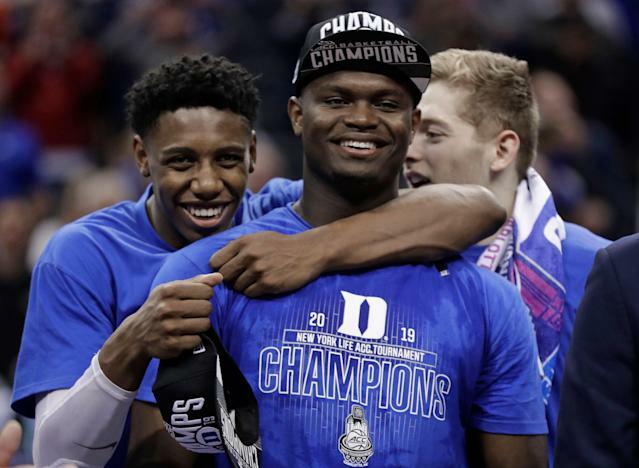 The argument for Williamson withdrawing from Duke and focusing on the NBA draft was simple: playing for Duke carried the risk of Williamson suffering a serious injury and seeing his enormous draft stock falter. Plenty of people, including an NBA star, argued for it. “I can’t just stop playing,” he said, after a 27-point, nine-rebound effort that added to his oeuvre of jaw-dropping highlights. “I’d be letting my teammates down. I’d be letting Coach K down. I’d be letting a lot of people down. That commitment to one’s teammates is admirable, though those comments might implicitly carry the unfortunate message to some that the Nick Bosas of the world are, in Williamson’s verbiage, “bad people.” Or at least that they don’t care about their teammates. Bosa is the Ohio State defensive end who encountered a situation similar to Williamson. A possible No. 1 overall pick in the upcoming NFL draft, Bosa suffered a significant core injury and opted to do the opposite of Williamson: withdraw from his program and focus on his professional future. The decision was controversial, to say the least. However, that comparison between Williamson and football players like Bosa who sit out games might be apples and oranges. As a football player, Bosa likely risked far more health-wise than Williamson had he returned. He had also already played two full seasons for Ohio State, while Williamson has been on the Duke campus for less than year. And Williamson is such a slam-dunk certainty to be the No. 1 overall pick this summer that it’s possible no realistic injury could have stopped him. Bosa never had that status. Of course, Williamson probably doesn’t care about any of this. He’s playing for one of the best teams in the country, a social media superstar and clearly going to make a lot of money at the next level, even if he’s not making money now (that we know of). Why do anything that could possibly derail that gravy train?